How many mentions does London get in Labour's manifesto? Former shadow foreign secretary Hilary Benn has spoken to ITV News after his sacking by Labour leader Jeremy Corbyn. He said: "At this critical time for our country following the EU referendum result we need strong and effective leadership of the Labour Party. "I told Jeremy Corbyn last night that I no longer had confidence in his leadership and he dismissed me from the shadow cabinet." He added: "I want to thank him for giving me the chance to serve our party." 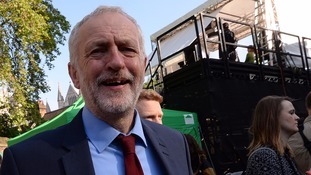 Labour is facing the prospect of "political oblivion" if it goes into a general election under the leadership of Jeremy Corbyn, a senior backbencher has warned. Dame Margaret Hodge, who tabled a motion of no confidence in the Labour leader, warned he is "standing in the way" of the party reconnecting with voters in an open letter written together with fellow backbencher Ann Coffey. If a general election is called later this year, which is a very real prospect, we believe that under Jeremy's leadership we could be looking at political oblivion. We believe Jeremy is standing in the way and preventing us from securing the confidence of a majority of voters. Ukip is targeting our traditional heartlands, not only do we need strong leadership to reconnect with these voters but also to make connections with those who voted to remain in the EU. The founder of a grassroots Labour movement closely tied to Jeremy Corbyn has warned MPs against launching a civil war with the party's members. Jon Lansman, the leader of Momentum, spoke out as party sources said that up to ten shadow cabinet members are set to quit today. The rebels are hoping to oust Mr Corbyn - who remains far more popular with much of the party's membership than his parliamentary colleagues. Labour MP Chuka Umunna has said that party leader Jeremy Corbyn's decision to sack shadow foreign secretary Hilary Benn is 'crazy'. In a Twitter post, he also wrote "destroy the Labour Party and the country suffers". The move comes amid a motion of no confidence that was tabled against Labour leader Jeremy Corbyn. 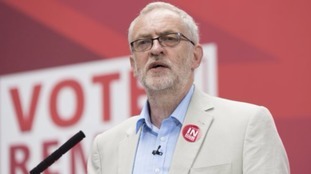 Jeremy Corbyn has faced fresh calls to stand down as Labour leader from on one of his own MPs. Frank Field said Mr Corbyn should resign immediately for the good of the party as "nobody thinks" he could lead Labour to victory if a snap election is called when David Cameron stands down this autumn. He also accused the leader of mixing some positive debate on globalisation with "serious claptrap" in other areas in comments to the Radio 4 Today programme. What Jeremy has been trying to do, with his social justice programme, is begin to answer those questions that are posed by the losers of globalisation but he clearly isn't the right person to actually lead the party into an election because nobody thinks he will actually win. A Labour Party member has told ITV News Deputy Political Editor Chris Ship that "dozens" of people in the party want leader Jeremy Corbyn to go following Brexit. They described him as "at best nonplussed, at worst pleased" with the vote for Britain to leave the European Union. Two Labour MPs have today submitted a motion of no confidence in the party leader. Earlier Corbyn defended his part in the campaign, saying that he and fellow Remain campaigner David Cameron had "different visions" on Europe.